Though I was out of town for the first couple of days of construction, I stopped by Thursday evening (the 23rd) and again on Tuesday evening (the 26th) to check out the progress and the new river. On the 23rd, I drove upstream about half of a mile or so to a small boat/canoe launch to look at the river levels there. This spot also is where the Salt Creek empties into the Des Plaines. Here are some photos. This is directly above the dam. All the land you see was a shallow muddy flat before the dam was removed. The exposed areas will be planted with different grasses and plants - some are already starting to grow by themselves which is a true testament to natures ability to heal. The crane was fitted with a pneumatic jackhammer. 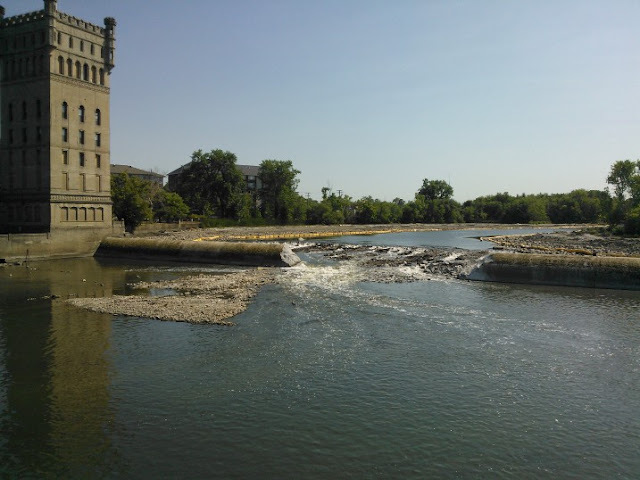 If you look behind the dam, you will see the outline of the original dam. That will also be removed. Also, if you look to the left side of the image, you will see the bow of a boat sticking out of the water. I can only imagine how long that has been there. One of the last remaining puddles of water in the mud flat. Before I took this picture, there was a small family of ducks splashing around in the puddle. Dam removal draws quite the crowd of curious onlookers. The conversations that I overheard were incredibly varied. There are a lot of different opinions on this project. This is the boat launch that I mentioned before. 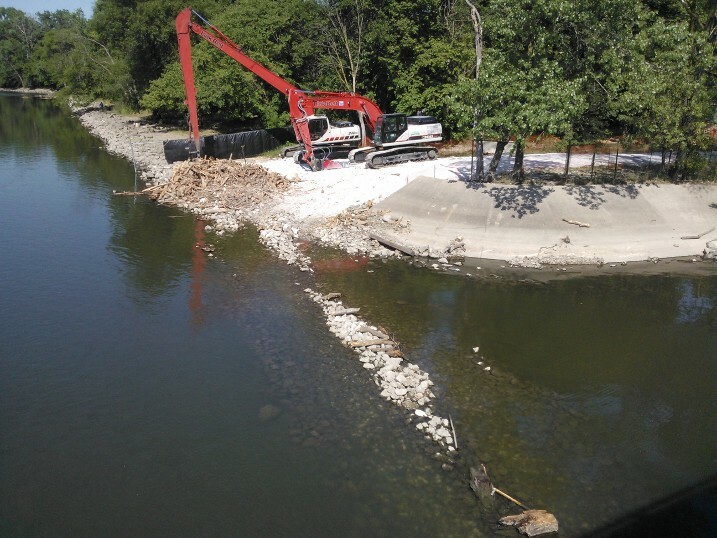 That mound of rocks had been about two feet below the water surface before the dam removal. I am standing at the edge on the launch which just a couple of weeks ago, would have been able to launch a relatively decent size boat. The new look of the Salt Creek in this area. Traditionally, this looked more like a slow moving pool of water. Now it looks like a natural rocky stream capable of much more life! Surprisingly clear water for a stream that is considered to be void of life. This is a welcoming look for me! Next up are the pictures that I took on the 26th. I didn't really go above the dam this day as I was focused on the river below the dam. One of the complaints that people have said about this project is "there goes the fishing." Now that the dam has been breached for several days, I wanted to see if life still existed directly below the dam where it was supposedly going to be ruined by this project. I was almost instantly shown that life still exists when I witness a mom with her young son fishing from the wall. They had a bucket full of blue gill and seemed to be catching them one after another. It was pretty impressive to see the number of fish there. 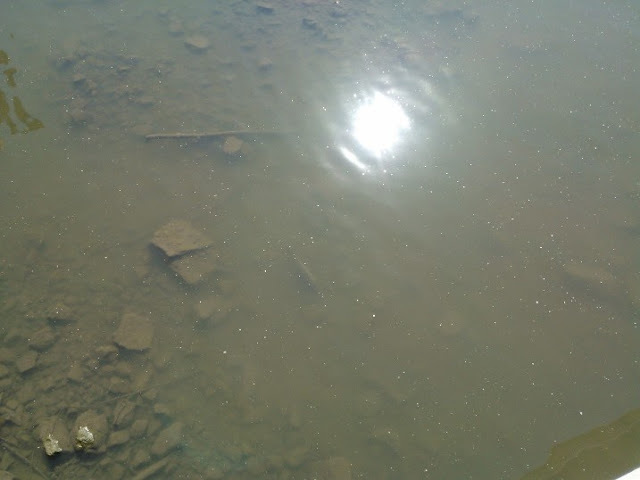 If you look in the almost dead center of the picture, you will see a small shape to the right of the two rocks - this was a huge carp that was at least 15 pounds. I was really wishing I could be down there with the fly rod to catch this thing!! 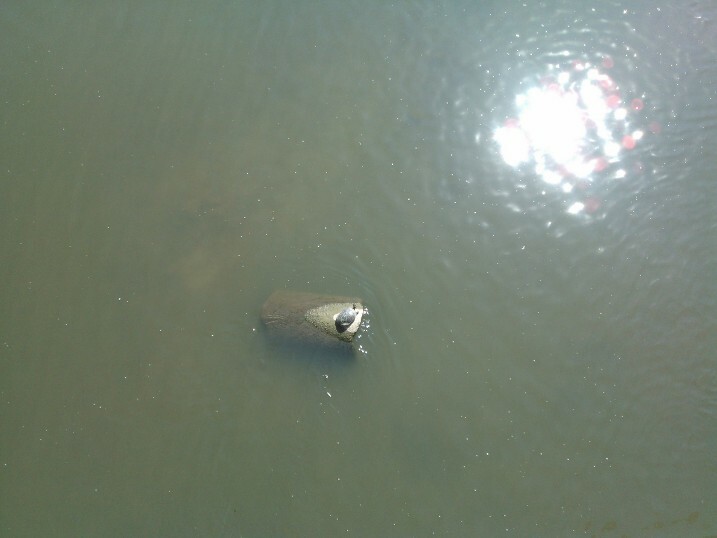 If you look closely, there is a small bump on that log sticking out of the water - it was a large turtle that probably had a shell that was about a foot long and eight to ten inches across. A better shot of the turtle. This was one of three large turtles I saw there. 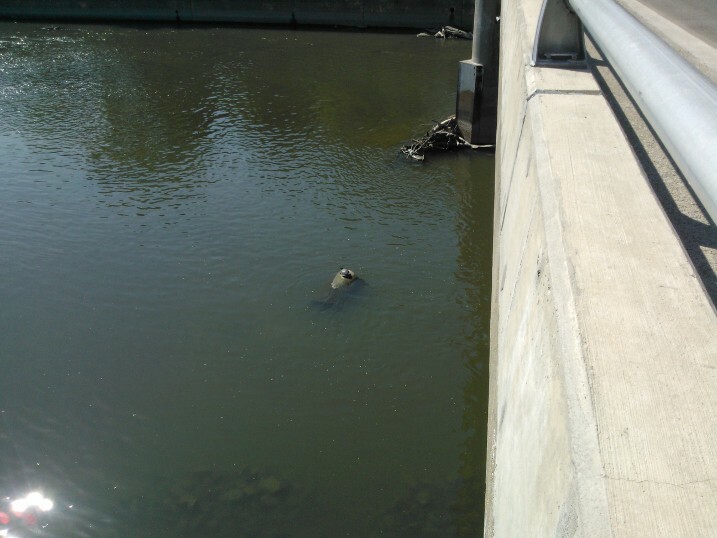 Once again, a sign that river life will be just fine after the removal of the dam. To be honest, I haven't see a turtle here in....well I can't ever really remember seeing one. On the other side of the bridge where the cranes enter the water. Overall, I think progress looks great. There is a lot of old debris like tires, barrels, and the boat that will need to be removed and according to the Army Corps of Engineers, that will all be done. The remnants of the old dam will also be removed so that a kayaker or canoer could actually paddle through. I think the only part that I am a bit nervous about is how bad the area is going to look with only a section of the dam removed instead of the whole thing. That part looks pretty ugly and still seems like it would be a safety hazard. Aside from that, I think the river, and its tributaries, is going to flourish because this project. If I had to describe how the river looks after the notching of the dam in two words, I would say "more natural"
Thanks! 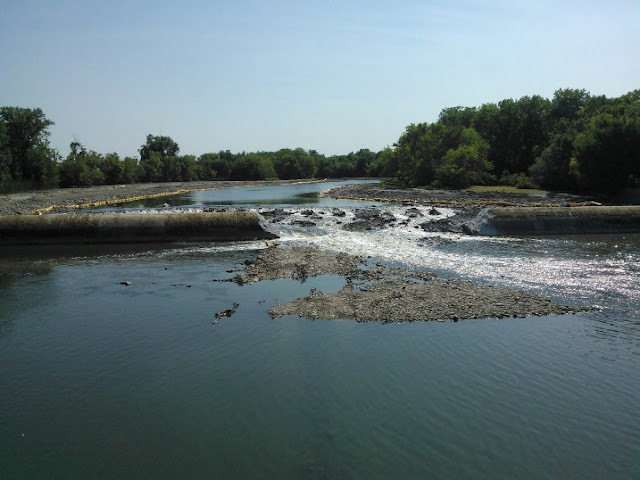 I love to see a dam go Bye. 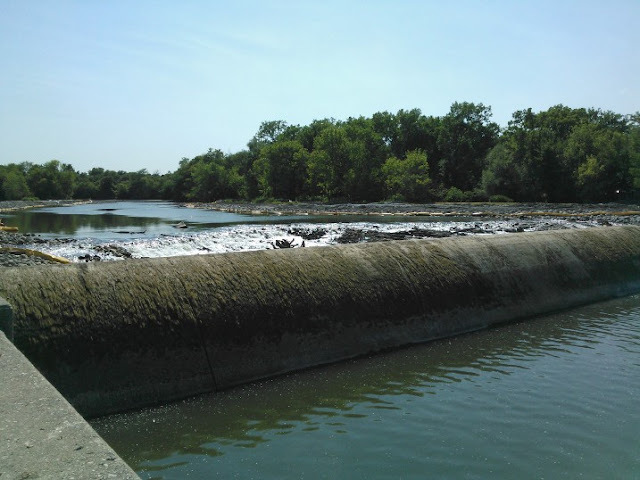 am of the belief that a dam severely hinders the natural ability of fish and other wildlife to find suitable habitat. I believe the river will be far better by not having the dam there. Thanks for the update on this project. I am very interested to see how the riverbank, and fish populations fare over the next year or so. It appears that you and I are not the only ones interested. As a matter of fact, my first dam post a few weeks ago has already become the 2nd highest viewed thread of all time! Awesome. Hope that mud finds a home in a wetland somewhere, and not downstream in the channel!!! Ricky - a dam is a literal barrier to genetic diversity among fish populations, and even some rare wetland plant populations. Me too....I think that the drought we are having could really help that. Kind of neat how that worked out. You're going to be surprised at how fast all the exposed rock and mud gets covered in green. I give it till fall. Seen it happen a couple of times on the Fox. They were going to do plantings, but mother nature beat them to it. Great shots of Salt Creek. Will be interesting if it gets some fish runs. Thanks for posting the shots. It's a great moment. Chalk one up to mother nature! I really do hope it does. I live about 2 miles upstream from the mouth and would love to be able to walk out my back yard and catch fish. Will be interesting when they breach the 1908 Horseshoe Dam. I paddled down there last Friday, 6-22, within 50 foot of that submerged boat. Bottom at center of channel was about 5 ft deep and solid, limestone likely. Silt buildup can't be much. John Mach went down there on Sunday found the same but took more samples. Said there was a marked slope on the north/south axis. Add in the 11+ foot drop in the 1.3 miles from Forest Ave and it likely will be an interesting flow. 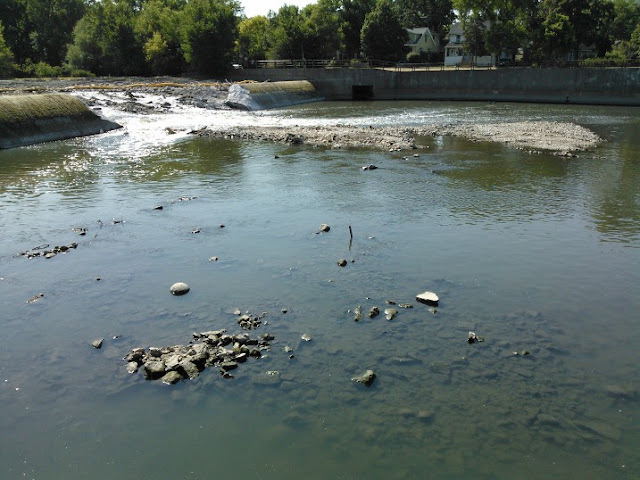 Ken G and other waders -- Do river bottoms change much over short distances and/or time? It will be neat when that happens. I think that is when the whole thing will finally level off. The water directly below the dam is quite clear so I don't think the sediment issue was as bad as I had thought it would be. River bottoms can change very quickly depending on river conditions and the substrate. If there is heavy silt run off, it can fill in holes very quickly. I would love to see this area in another year. The differences will be striking I'm sure. Beautiful! Me too! This river has never really a very natural feel to me in this general area. I think that will finally change and I'll have to travel a lot less to get to that feeling. ARE THE CANOE WINERS GOING TO PUT WHEELS ON THERE CANOES NOW THAT THERE WILL NOT BE ANY RIVER LEFT????????????????? As long as they blame mother nature, I can understand the complaints! I worry that some of these Riversiders, going forward, every time they get a mosquito bite, will yell in the direction of the DP river. Having grown up in Riverside it is sad to see it go however it was great to see my best friends house in the pictures. Lots of great memories at Indian Head Park! Three of the guys I went to High School with went over the dam and drowned. Very sad time for Riverside Brookfield HS. I'm a late comer to this thread. I worked in this area for a long time and retired a few years ago and moved south. It will be very interesting to see how this opening will benefit the river. I think that allowing nature to take it's course will help greatly. I used to fish off the bridge (when it was allowed) as a kid with my dad. We caught some whopper carp. Some good memories. Thank you for the photos. You did a great job. Please keep them coming as time allows. Better late than never, Eric! Thank you for reading and taking the time to comment. I believe that you hit the nail(s) on the head and I truly can't agree more. Nature is an amazing thing when you let it do its thing. I think that we will really see the benefits of the dams removal once nature provides us some rain and higher water levels. Once that happens, I believe wholeheartedly that fish will begin to enter some of the tributaries - especially the Salt Creek.